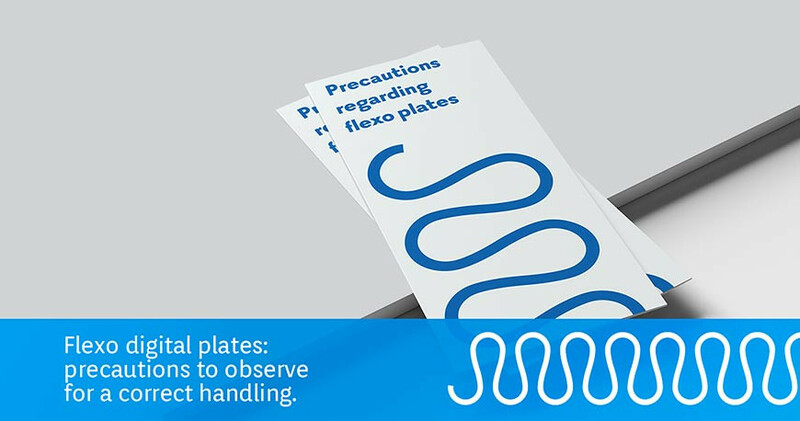 Flexo plates precautions: handled with care. Flexo plates for printing are high-quality, sensitive and delicate products. They must therefore be handled with special care. 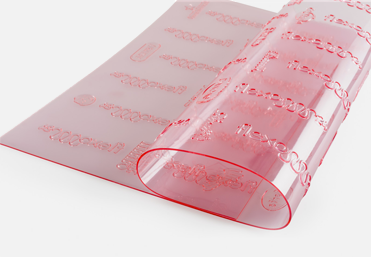 The flexo plates you purchase from Flexo 24 are delivered in a package. Make sure that the package is intact. Open the package carefully. Do not open the package with cutters or in any other way that may damage the plate. All the necessary precautions must be taken to protect the flexo platesfrom abnormal pressures, creases or other kinds of damage that may occur. Before mounting the plates, we recommend you always check the condition of the material you have received. Please note: check and verify any deformations and creases both on the upper part of the engraved plate and on the lower part of the base film. If necessary, contact the customer service. While using the plates on the flexo printing machine, even if the plates are elastic, do not apply excessive print or anilox roller pressure. At the beginning, always maintain the pressure at minimum. To avoid damages and loss of quality, make sure that all the requirements are met for proper storage of the plates after usage. Please see below.. The plates can be stored on cylinders, sleeves or removed and stored horizontally. After printing or during downtimes, the digital flexo plate must be carefully cleaned to avoid surface cracks due to the ink drying process. After the flexo printing but before storing, clean the plate thoroughly using a compatible solvent. S = Suitable (Swelling less than 10%). P = Partially suitable (Swelling 10-25%). 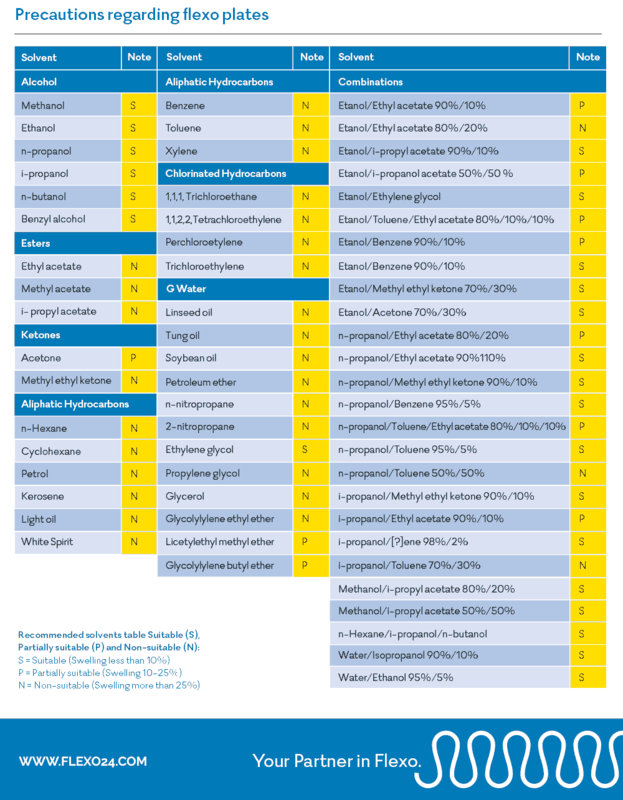 N = Non-suitable (Swelling more than 25%). 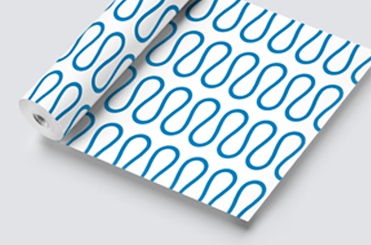 Before storing, digital flexo plates must be thoroughly cleaned and ink residues must be removed. When it dries, the ink on the plate surface shrinks and break, causing damage to the plate.. When cleaning the plates, DO NOT FOR ANY REASON use hard brushes or rough rags as they will damage the surface. After cleaning, the plates must be dried to remove any residual liquid or dust. The plates must be dried, preferably with compressed air, without applying excessive pressure, to remove any residual liquid or dust from the non-printing areas. For optimal storage, the dried plates must be stored in an air-conditioned (15-25 °C), ventilated and ozone-free environment, away from light and direct heat sources. We recommend storing each flexo plate separated form the others by using the same synthetic foam sheet with which it was delivered, in stacks of maximum 15 cm (6"). Then we recommend storing the plates in a black polyethylene bag to protect them from light. The plates react with ozone, producing cracks on the surface. They must not be stored near ozone sources. Especially in summer, when the air has higher ozone concentrations, keep the plate in the dark. After cleaning, the plate must be thoroughly dried. Areas that are not perfectly dried may lead to the build up of dust residues and stains that can be difficult and harmful to remove. If solvent residues remain, the plate may react with swelling. Do not keep the plate close to direct heat sources. We recommend keeping the plates in an air-conditioned (15-25° C) environment. Plates must be protected from UV light exposure, which could lead to hardening and premature ageing. Every scratch or mechanical pressure on the surface of the plate will inhibit its printing capacity on that area. We recommend NOT storing the plates in high stacks as it can cause strong damaging pressures to the reliefs, as well as problems during detachment. We recommend storing the plates in black polyethylene bags to protect them from dust and light.